Home Articles CA Preparation Strategy for CA Final Law. .!! Preparation Strategy for CA Final Law. .!! A quick disclaimer before i start : My Articles doesn't give 100% guarantee for success in exam but You’ll have to sit down, work hard & work smart. If you can stick to it, I’m damn sure you’ll definitely be able to score a good marks in the exam. "A famous quote said by Lord Krishna in Bhagvat Gita"
don't cry for what you lost. ."
even luch has to work"
Hello everyone, first of all, thanks a lot for giving such a favorable response to all my previous articles. Now in the same manner I would like to throw light on preparation CA Final Corporate and Allied laws. During my interaction with many students of CA Final and their questions are "how to prepare for Corporate and Allied law", I come across difficulties faced by them. More particularly, what to read, how to read, what are important topics and what kind of language should be used while writing paper. 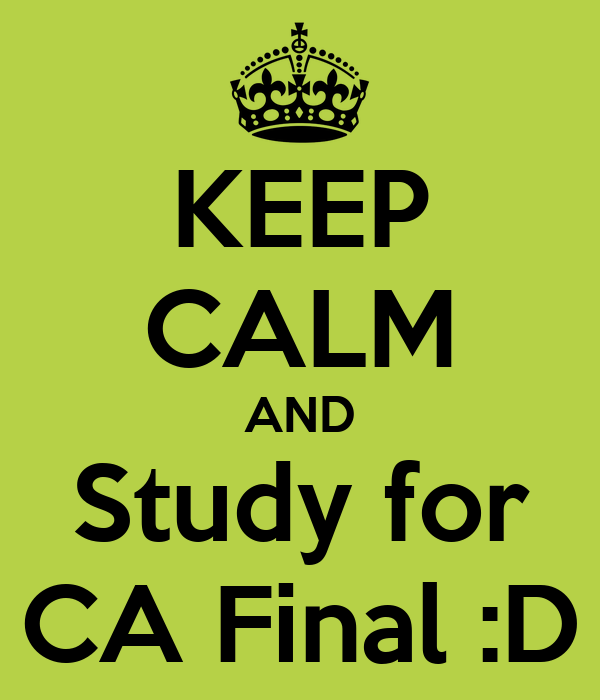 The purpose of these articles is to enable CA Final Students to achieve 100% success in CA exams. The students are expected to have not only the analyzing skill but also application skills in company law, while in allied laws they are expected to have the analyzing skills (an overview of various allied laws) stated in the syllabus. Accordingly, preparation strategy deserve care, concern and caution. Students have to be always alert in updating their knowledge of current developments, recent amendments in relevant laws and recent legal decision by regular consulting journal like CA and CA students. Final course students have to be thoroughly knowledgeable of important guideline, leading judgments, notifications etc. Some students have been made a concept that Law is all about Companies Act. But there a slight difference if you have analyzed this paper properly. According to me there are lot of small topics which are easier and can be prepared with 100% accuracy in short span of time. Rather than devoting timing on preparing on these said papers (and getting it half correct in exam hall) students can easily cover small topics in a short span of time (and score 40-50 marks with full accuracy). I would like would like to give some guidance on CA final Law Paper based on my experience. While starting, you can go to easy and interesting topic like Dividend, directors, Audit etc. But never ignore or try to underweight Allied laws part, these cover 30 percentage of exam paper in paper 4 “Laws”. This portion play a vital role in this paper. If nothing will work, then surely this will work in this paper. Weightage of this portion usually remains 30-35 marks. You cannot skip. "Strictly Don't gamble with Allied law portion". The most students are failed only because of this portion. Lot of changes and amendment are taking place in provisions of SEBI Guidelines. Keep yourself updated. Most of questions from FEMA includes; residential status and current and capital account transaction. You will find one question from interpretation of statute. b) First of all cover the topics mentioned in Category A & B thereafter focus on Category C. After covering the Category A & B , you would gain confidence on the subject. If you feel that you have a little space in time then accomplish the topics Category C. Category A & B is equally important. b) Must read our Practice manual. 1) To understand the pattern of questions and answers I would advise you to observe the answers from the scanner and ICAI suggested. 3) The above practice will consume your time. But if you are not doing in the above manner , you cannot able to handle the questions in the exam. Read >> understand >>make a short notes >> close the book and try to memorize >>repeat the same before few hours of sleep >> If not getting, again do the same exercise. They are the life blood to law and it is very much essential to have relevant bare acts while reading the study materials. while reading bare acts, you may test yourself side by side as to which of the subject-matter dealt by what section. 1) Don't play with the language of law specially definitions. it is strictly recommended to put the definitions in the exact language. However you can take slight liberty while drafting your answer in respect of the other law language but the context, texture, interpretation and meaning should not be changed. 1) As per my understanding of law is a requires lots of quick and logical application of mind to answer practical problems. Hence I’d suggest you to give a reading to ICAI law study material to understand the depth and figure out the efforts and time required for preparation. By this kind of reading you may prepare a strategy for audit purpose. 2) Lack of good presentation especially in theory paper is one of the major drawbacks for most of the students. In theory subjects good presentation of theory is must along with mentioning case laws and sections etc. So I’d request you all to take note of the same and refer answers pattern from ICAI materials. 4) It is desirable to support answers with relevant sections and leading case laws on that matter wherever necessary. Extra efforts are to be made in this direction. If by any chance, students do not remember the section numbers and case law while answering any questions in the examination paper on the subject, they may not lose heart on this score. They may otherwise strengthen their answers by appropriate reasoning and examples. However, they may desist from citing wrong sections numbers or irrelevant case laws. Keep one thing in mind - write the sections and case laws only when you are 100% sure, otherwise leave it. " Make habit of good reading along with preparing notes otherwise you won't able to cover the syllabus. 2) Don't use different notes foe one topic. Finalize your notes before starting final examination preparation and stick with them. 2) After the FR, SFM & Audit exam, first and foremost, forget about the FR, SFM & Audit exam-it’s a sunk gain or sunk cost not relevant in decision making. 8) Answer the questions with due emphasis on the provisions of Sections. 20) Before answering any question you need to make a rough solution in your mind and then go accordingly. So that’s just about it! This is exactly what you have to do & more importantly, how you have to do it. I know you must feeling really good after reading all this but in order to get the desired results, its very important to follow the abovementioned steps and implement your study plans. Just reading all this, won’t do you any good. Further, if you will need any kind of help, please ping me thru mail or facebook and please keep the spelling of my mail id specially "agrawal" in your mind while typing it. If you are also interested for preparation strategy for CA Final Group-II papers too then Please let me know by commenting here or thru mail. A well written article. Thank you so much, helped me in building my confidence.